The Finest Travel & Workout Buddy Is Waiting For You! Are you a sports enthusiast or a nature admirer? Do you feel dehydrated after a long day outdoors? Fed up with bulky hydration packs and flasks? Looking for a water bottle that is a phone holder at the same time? If so, then today is your lucky day! The most multipurpose sports bottle with phone support has just been released. Grab yours, fill it up, secure your phone,and off you go. Enjoy your workouts like never before without dehydrating from now on. Keep your phone close by and never have to miss an important phone call from work. The zippered cell phone pocket can carry your keys, cash and other gadgets. Keeps Your Drinks Cool For Much Longer! Our hydration flasks are made of high quality BPA free plastic so as to ensure safe drinking. Each bottle has an ergonomic and non slip Neoprene pouch that keeps your drinks at the perfect temperature for much longer. Plus it facilitates holding to the fullest. Worry no more about slippery bottles. Worry no more about easily broken glass bottles. Wear the cool and elastic wristband to swipe sweat from your forehead or neck. Skyrocket your workouts and gym sessions.Break your own personal records! · ... long walks in the park! · ... walking your dog in the woods. · ... camping, lake fishing or hunting. · ... running, jogging and outdoor training. · ... skateboarding or bike riding. · ... hiking, mountain climbing or even rafting. · ... beach excursions and road trips! 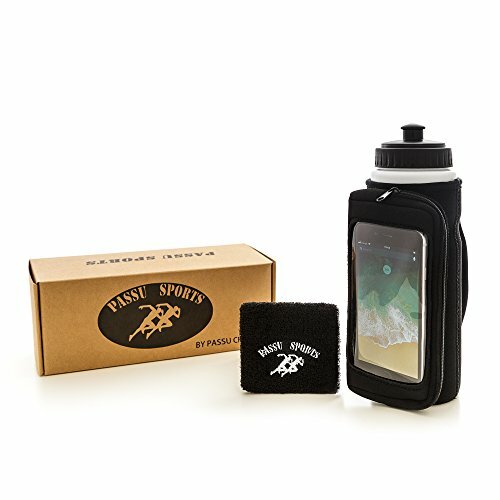 Then a PASSU Sports Handheld Hydro Bottle With A Phone Pouch Is A Keeper! GENEROUS SIZE HOLDS ALL YOUR DRINKS: Forget about small size hydration flasks and quench your thirst on the spot with our 25 Oz (750ml) water bottle. Being generous in size but not bulky at all, this water bottle holds all your favorite beverages in style. From water, sports and energy drinks, to protein shakes and smoothies! LIGHTWEIGHT TRAVELS WITH YOU: Meticulously crafted to satisfy even your most demanding training needs, this handheld running water bottle with phone holder is lightweight, compact and easily portable. Hold it in your hands, hang it from your backpack or place it inside your fanny pack. STAY HYDRATED ALL DAY LONG: Whether you are training for the marathon, walking long distances solo, or traveling off the beaten track, this hydropack is the way to go. Fill it up with water and stay hydrated. Ideal for women and men, outdoors, sports, camping, hiking, running, climbing, fishing, hunting, excursions, trail, and road trips! EACH DELUXE SPORTS PACK INCLUDES: a lovely handheld sports running water bottle with phone support. Made of stretchy Neoprene, this touch screen zipper pocket can hold almost all kinds of smartphones and iPhones up to 5.7". Along with the hydration flask, you will get a Bonus sweat wristband to wipe your sweat and an informative Sports Nutrition eBook. TRY THE HYDRO FLASK & BONUSES RISK FREE: We here at PASSU Sports have your 110% satisfaction as our top priority. That is why this sports running water bottle combo is backed by our 100% money back guarantee policy! Get yours today or make a thoughtful Valentine's Day gift to a friend or dear family member. If you have any questions about this product by PASSU Sports, contact us by completing and submitting the form below. If you are looking for a specif part number, please include it with your message.